Phase 2 Beta News: An announcement has been sent to the names on my list of phase 1 testers. The start date for the next testing phase isn't certain, but it will most likely be before the end of 2003. So far, only a few have responded to the email. Replies are due by Friday, November 14th, after which any phase 1 testers who have not replied to the phase 2 email will be removed from the list. If too few responses are received, we may open up general beta sign-up applications again. Development News: Below is a screenshot showing the new 1024x768 layout. Originally, StarLock was going to support only 640x480 (does anybody still use that?) and 800x600 (my preference). Players using 1024x768 would use the standard 800x600 game window, which would appear small on their display. It can be maximized, but the frame sizes weren't appropriate and the text would still be small. Since I'm finding that more and more people are using this higher resolution (even on smaller monitors that are really better suited to 800x600), I made a third screen layout (and style sheet to match), to accomodate players who want a full sized game window at that 1024x768 desktop resolution. At the bottom of today's news, one new screenshot (shrunken here for easier viewing) shows the layout of this new option. �Classes� were a part of the game in Beta 1, but, since there was no way to select anything other than the �NONE� class, it didn't really matter. In trying to finish some of the loose ends, class selection is in the works. This isn't something players choose during character creation (all characters start out the same - this is an adventure game at heart), it's something that players choose from time to time during the game. The �Tugger� class can now be selected by joining the Tugger's Guild. Other classes will be selected in other ways at other locations in the game. Classes are used differently than in many games. In StarLock, this will control your daily allocation of turns, not your stats and other abilities. This is a unique use for an in-game class system. Seven quests are now finished. The complete game will require eighty of these �storyline� quests, and a variety of smaller side quests and tasks. With another weekend here, I am hoping to get more done on the game. The possibility of having player versus player fights has been shelved for now, for several reasons. Other kinds of player interaction and competition may be a better idea for a game that isn't focused on interpersonal conflict. If you want to keep up to date with what's going on, remember that I usually post to the forum far more often than I update the news page. The forum is HERE. A few of the Beta 1 players post there as well, and it's the surest way to get the latest news on this ongoing project. It was pointed out that the last estimation called for a Spring '03 release, and I've missed that. I do feel that development is moving toward a second round of beta testing. I have moved an estimated public release to this Fall, with beta testing this summer. It's possible that the game will be finished and ready for play before the story and all quests are finished. Mini-Game Screenshots: I have posted screenshots from the four "mini-games" currently added to StarLock. More mini-games will be added, to give even more variety. Mini-games are used at various places in the game; portable "hand-held" games you can carry in your inventory, tasks you do in relation to a quest, prizes at a Marizen Market booth, and so on. Expect quite a few more in the final version! 4 Screenshots of StarLock "Mini-Games" From Pre-Beta2, April 16th, 2003. Click to Enlarge! No News is Good News! There are times when development slows or halts, for one reason or another. Just read back through old news to see what I mean. But, there are also times when keeping the news updated becomes less important because development is going well. This is one of those times. If you want to keep tabs on progress, even when the news is out of date, be sure to visit the forum. I often brainstorm there, and it's your opportunity not only to find out what's going on, but to offer your opinion and feedback as well. Welcome to StarLock: If you're new to the StarLock website, you're probably wondering what this is and what it's all about. 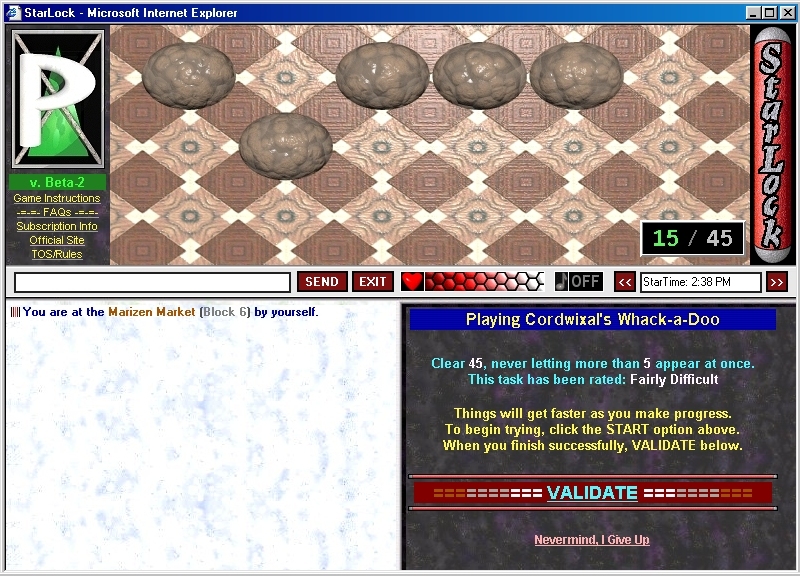 StarLock is a browser-based massively multiplayer RPG/Adventure -- a sci-fi game in the space opera genre. The game has been in development for four years. Although it hasn't been opened to the public yet, closed phase-2 beta testing is expected to begin in a few weeks. Is It Free? This is the #2 question that we're asked (#1 being "when can I play it?") Although this is explained in the FAQ, it's probably a good idea to mention it again on the main page. Prowler Productions is a part-time game development company, but we're professionals in other areas of the computer industry (I'm the lead programmer for a software company here in Wichita, for instance). We don't do this as a hobby, nor do we operate as a non-profit charity. For StarLock, we have opted to allow a more robust membership plan, as a way of appealing not only to our goals, but to yours. In short, it's free. You can play for free, and never have to pay anything. Here's the catch. You'll get 10 hours of play time when you start, and you'll gain 20 minutes a day whenever you drop below 3 hours. Is 20 minutes enough to play each day? It depends on how you spend your turns. The free time is intended for players who can't afford to subscribe, or who simply don't want to subscribe, or who feel that they don't play enough to justify spending any money for an online game. We agree that the players who don't use many resources shouldn't have to pay, but the people who do, should. Because players have daily turn limits, tier-1 (free) players won't be outclassed by the paying (tier-2 and tier-3) members. Since free time accumulates up to 3 hours, part-time players can spend hours in the game when logging on periodically, advance and maintain a character, yet never pay a penny for it. We're often asked why we don't just make the game totally free, unlimited time for everybody, and the answer is simple. It's a stupid, stupid company that goes into business for the sole purpose of going bankrupt. In-game ads don't work (and they really cheapen the quality of a game). But check out our membership plan in the FAQ - we think you'll like it! Want To Know More? Are you interested in finding out more about the game? We have four years of news archives (grouped by year - a link at the bottom will take you back each year). You can also discuss the game, ask questions, and get the opinions of players from beta phase 1 in the forum. If this is your first time to the StarLock website, be sure to bookmark it. Check back periodically for more news and more announcements. Brand New Screenshots: I've posted 8 new screenshots from the pre-beta2 game, to give you a few more glimpses into the game world. The most notable difference is that the status bar (where you type chat, view your health meter, etc) is now across the center of the game screen instead of at the bottom. This was done due to a funny quirk in the Opera web browser. Any time a page is loading, Opera pops up a status/progress bar at the bottom, which almost completely covers the StarLock menu bar. It was really annoying, and even though Opera isn't my browser of choice, it may be for some. I couldn't figure out how to disable it automatically, so I moved the StarLock bar up so Opera won't cover it up. I was going to do this just in Opera, but then I noticed that it looks a lot nicer up there under the "scene" graphic area, so that's its new home. :) Opera 6 didn't have a real-time page rendering method, which means any layer rewrites wouldn't show up. It wasn't a big deal, since so far the only part of StarLock that uses layer rewrites is the ShiftZone PPD game within the game. But, Opera 7 seems to resolve this, and as far as I can tell, it's fully compatible with StarLock! ShiftZone works in Opera 7! I also wasn't happy with the transparent overlay for superimposing options on the "space" graphics. Two of the new screenshots show the new method, which uses the Layer/Div opacity setting instead of a "checkboard" graphic (which just didn't give the results I wanted). Quest Development: Perren's Quest and the Googlie Brothers Quest (which was begun for Beta 1 but never finished) are almost done. Development has been going very well lately (even without frequent news updates). I'm hoping to be able to announce a (possibly tentative) Beta Phase 2 date in the next few weeks. It's Like Writing a Book! When you put forward an effort to tell a story, authoring a game can be quite an experience. In my previous efforts, except maybe in some of my Text Adventure (Interactive Fiction) games, the hard part has been the programming. 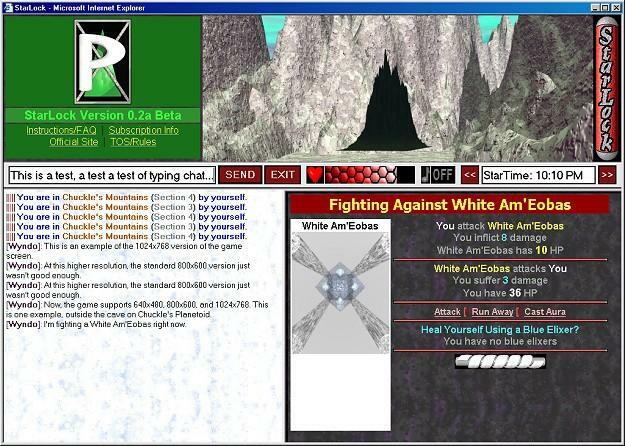 Text was sparse, or in the case of some games like Lunatix Online, the text is there just for gameplay purposes. In StarLock, the story is the purpose for the game. It occurred to me how much text is going into this when I spent an hour and a half just working on dialogue for part of a new quest. When it was done, I had to step back and think about it. It's very progressive, in that game players traditionally prefer to skip reading and get straight to the reward. In StarLock, reading the text is meant to be a big part of that reward. When Perren tells his theory about Chuckle, it's ten or eleven paragraphs long (or "pages" to the game). Printed, it would probably be a full page of text. That's a lot for a person to read. At the time, I considered chopping it way down. I didn't, for a few reasons. One, it's not meant to be like a console RPG where the most an NPC ever says is "Somebody told me that Big Bubba really likes Tulips" or "Our town is under attack!" or "I heard that a monster lives in Swamper's Lake." Two, the text - the story - is the reason for the game, not the other way around. When I read a book, I like to be entertained. I like to see the author's vision, experience the story in a way I wouldn't get from some truncated summary or synopsis. Three, it would be difficult to cut the dialogue down even if I wanted to. In order to tell the story, and to give personalities to these characters, it's necessary to be expressive. I'm banking on finding players who agree with me. Perhaps it's a risk. If you don't like reading, this game probably isn't for you (even though it's also more graphical than any browser-based game to date as well, with thousands and thousands of rendered scenes). The goal is a game with an appeal like a good book. The goal is an enteraining experience, not just a game for game's sake. I want players to be excited about the game - excited as the story progresses and excited to read it all. Yes, A Quest: One of the roadblocks in starting a second round of beta testing has been the lack of quests. The lack of quests leads directly to the lack of most of the story (since the story unfolds through these quests). The quest on Chuckle's Planetoid is starting to come together, which includes Perren and the "mountains" that were added after Phase 1 ended. A good suggestion from Beta 1 was that an early quest should happen there on Chuckle's Planetoid, without the need to travel elsewhere. Vitality and Vigor Alerts: Somewhere near the beginning, an NPC will explain how Vitality and Vigor works. Of course there will be instructions that explain the same things, but what I've always enjoyed in a game is intuitive gameplay, where the game itself teaches you what you need to know, when you need to know it. In StarLock, Vitality is expended for certain tasks. It's like a "turn" you use, and is limited each day. For instance, beaming up and down uses 3 vitality, attempting skill tasks like running and swimming and climbing and jumping uses 2 vitality. Walking around certain areas uses 1 vitality. Players will need to understand this early on, to avoid the shock of realizing that their "turns" are over for the day. A message will now appear in the lower corner (over the "Quick Stats") when Vitality, Vigor, or Engine Energy (if the player has a rig) drops low. This "alert" will remind players that their turns are running out for the day, which will be helpful for those who want to return to a social area to chat without getting stuck someplace. And in Other News: Massive Online Gaming magazine has announced that their publisher, Versus Books, is going out of business. As a result, they're going to publish the mag themselves, at 40% of the original cover price. It will be available monthly, by subscription only. Issue #1 was incredibly impressive, and I'll be posting more information and an updated link when I know more. Emmansa Village Leasing: The ability to rent an apartment on Emmansa is nearly completed. In fact, renting, paying rent, entering the apartment, changing the locks, and several other things related to this already do work! Overdue rent is also tracked, for eviction notices and (if the Master Key isn't returned within 10 days after an eviction), arrest warrants. The two big things left to be done are allowing other players to "knock" on a door to be let in (right now, keys are needed to go inside, but "knocking" will pave the way for more social activities, parties, merchants, etc), and the ability to change the wall color (there will be a painter in the Emmansa Village that will help). Oh, and I still need to fill in the text and options inside an apartment. Currently you can enter, drop items, and exit, but you can't do anything else (sit down, go to sleep, examine bookshelves, and so on). To rent an apartment, a player must have at least 75 Positive Reputation points, and 0 Negative Reputation points. Rent is $1,500 GC per month, pro-rated for the first month. These numbers are subject to change, but do seem right. Currently, Master Keys can be auctioned off, which would allow a person to pass their apartment to another player, which will lend value to real estate when the village fills up, and will be an option for players without the right reputation stats to still get into ownership of an apartment. When the game goes live, becomes popular and grows, there will probably be apartments on other planets as well. Straight Off the To-Do List: A few things from my large to-do list have also been done. These include the ability to see what warrants brought about an arrest when you're turned in for a bounty and caught (in case you hadn't logged on to check them before getting arrested), multiple inventory pages to allow more than 8 slots (32 will be the max, and more slots above the initial 8 will be available as players progress), Level 1 Pagers and Scanners are now available for sale by the Marizen Merchant "Karvasson", and of course, the player apartments are very far along. I also added a script command to "send mail" to a player, using the already built-in mail system. This will be used for a variety of things, but initially, it will be used so that when certain things happen but aren't necessarily obvious, mail can be sent to the player. As an example, if you are arrested and have a loaner or rental rig, it's automatically returned to the owner. Or, if you have an overdue Emmansa lease, the keycard gets returned and you get 5 Negative Reputation points. These things aren't really "mentioned" at the time of the arrest, so mail to the player will help avoid confusion later. Contemplating Beta 2: I think it's still too early for the second round of closed testing to begin, but if the current rate of progress continues (and provided I'm able to get more quests added), I can see Phase 2 starting perhaps in late February or in March. It will depend on how far along I get, of course. Caves and Elixers and Houses: This past weekend, a monster and part of a quest was added to the new cave in the mountains near Chuckle's pub (mentioned in prior news). I also went through some of the original quests that were added prior to the ability to "use" an item from inventory, and updated that. Now instead of getting an option to "open the cemetary gate" on Marizen, a player will "use" the key from within inventory. Same with placing the flowers later in the same quest. This actually simplifies the scripting of those quests a little, and makes it more consistent with how future quests will work. This weekend I also added two new elixers (but not yet available in merchant stock). These are Vitality and Vigor elixers, which will be handy for emergencies. Presently, a player could get stuck with no turns left for the day. Although there is a limit to the number that can be carried, this will help players who want to exit an area and head back someplace for socializing or whatever. To prepare for apartments and/or houses, I made a change to the inventory database to allow two "custom" variables, and I designed the icon for the access card. The custom variables will be a way to attach unique values to any item in inventory. This will be necessary later when players are able to write their own add-ons (to give away or sell in-game). It could also be used for other item customizations, and the custom values will be carried with that particular instance of an item. In the case of houses, this is necessary to allow a player to own a "master key" for his or her own house or apartment. One of the custom values will represent a house number, and the other will be a hidden, unique identifier useful in changing the locks (so that if you give a duplicate key to a friend, you can have the locks changed and the old keys no longer work). I've been thinking this out more than I have been coding it, but this week I plan to implement this. I'll post more as it develops! 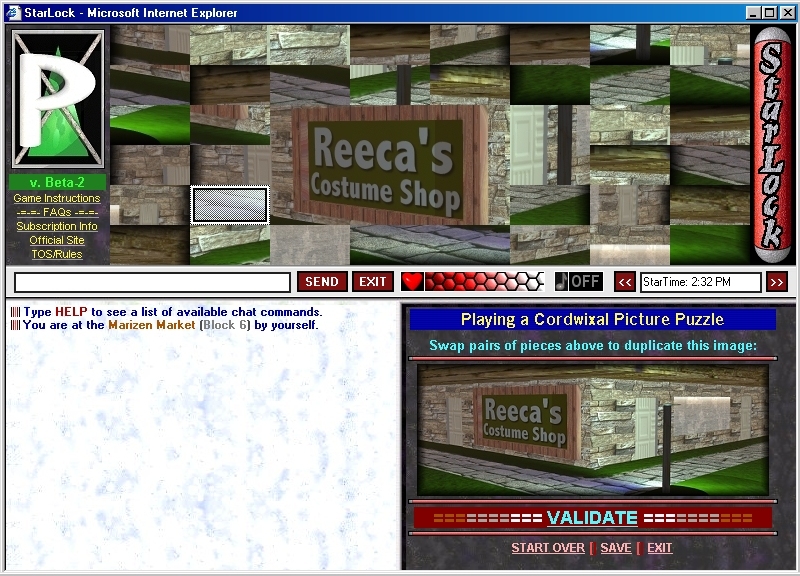 More Items: Several new items have been added, including three levels of scanners (which controls the mouse-hover text for task difficulties, vitality and vigor usage), three levels of portable pagers (used for talking to players elsewhere in the game, where previously all paging was allowed by default), and some teas and pies available from Crelecto (the Apeville Chef). Most of it is done - I just have to add the pagers and scanners to merchant stock at some place. I also made an internal change to the items database which will make it easier to identify how each item is used (read, play, start, use, eat, drink, whatever).